‘At the end of 1984 a conference was held at Wakefield, concerning the plans to close the mental hospitals. The day was dominated by reports and discussions of the Italian experience of just such a policy. Many were impressed with the work of the radical reforming group, Psichiatrica Democratica, which had cut across the crippling disciplinary boundaries of mental health care in Italy, and had produced very significant results. It became apparent at that time that a number of mental health workers and ex-patients in the region thought that a forum for debate was sorely needed. A forum that was non-aligned politically, professionally or by trade union. A forum in which all views could find expression. A group came together and decided that the first objective in a campaign for a more democratic pscyhiatry – to address all issues in the field, not just hospital closure – was to establish a magazine. ASYLUM is to be published quarterly by this Yorkshire-based group of mental health workers, ex-patients and interested parties. We intend the magazine to be THE FREEST POSSIBLE NON-PARTISAN FORUM FOR DEBATE FOR ANYONE IN ANY WAY INVOLVED IN MENTAL HEALTH WORK. WE WISH TO SEE A MORE DEMOCRATIC AND HUMANE MENTAL HEALTH SERVICE. WE KNOW THAT EFFECTIVE ACTION CAN ONLY EMERGE FROM HEALTHY, DEMOCRRATIC DEBATE, IN WHICH ALL SIDES CAN PARTICIPATE AND BE HEARD. Those in charge are fully aware of the value of unity in action. ASYLUM is offered as a vehicle for unity amongst those at the sharp end of psychiatry. This is yours, the readers’ magazine. We welcome all contributions. We intend to edit minimally and in full consultation with contributors. If you have to contribute anonymously, that doesn’t matter. Within the editorial group there is an admiration for the work of Psichiatrica Democratica. We are agreed amongst ourselves that the use of coercion, locked doors, violence, drugs and ECT is, at the very least, regrettable. But exactly how to organise threapy remins the fundamental problem. 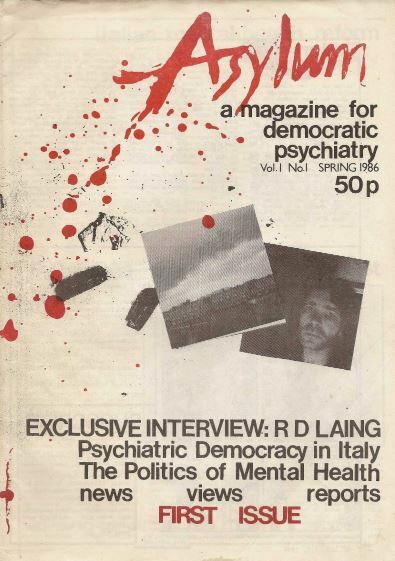 And so this issue continues with the theme of Italian reform, including an article about the founder of Psichiatrica Democratica and one by a nurse who lived through the experience of closing a hospital down and moving out into the community. We also include articles on other issues of mental health care and reform that we feel are very important today and for the future. This is what we think. What do you think? The editors of ASYLUM invite your contributions as readers and participants in a movement to make psychiatry more responsive to the real needs of patients and of those employed to relieve their distress’. In Italy nurses grow and mental hospitals fade away – Giovanna Battaglia– Psychiatric nurse. Trieste. 2. the British Network for Alternatives to Psychiatry. 3 Campaign Against Psychiatric Oppression. Sanity, Madness and the Psychiatric profession – Lin Bigwood, RMN, talks to R.D. Laing. Improving the Quality of Mental Health Care – Now. – Rick Hennelly. The MIND Conference 28-29 November 1985 – Lin Bigwood.